Most contemporary car structures are made of a number of complex steel or aluminium press-formed panels, which are typically welded together to form what is known as a monocoque. The investment required to support this technology can only be justified at typical production volumes of hundreds of thousands over the vehicle lifetime. Lower volume vehicles, often termed niche, require different technologies needing much lower investment. 13 years ago, when the Elise was conceived, Lotus identified that aluminium structures that were adhesively bonded and riveted together not only required low investment but also met the fundamental requirement of low weight whilst remaining extremely durable. Since then much has been learnt, resulting in the latest structural concept to be used on the forthcoming Esprit replacement. This article discusses the major technical milestones during this period, hopefully showing the logic that has led us to where we currently are. The term “structure” in the context of this article refers to the underlying structural elements of a vehicle, sometimes in layman’s terms called the chassis, frame or tub. It is the multifunctional “ monster bracket” that supports and connects major systems such as the engine and gearbox, suspension, seats, steering and doors, which in order to operate correctly must have mounting points of the correct stiffness. The structure must provide enough space around the occupant for ergonomic comfort whilst being strong enough to resist crash loads. Peripheral to the occupant cell the structure must be soft enough to absorb crash energy at levels prescribed by legislation aimed at reducing injury. Even the normal use of a vehicle puts huge forces into the structure, and any perceived flexing and bending is unacceptable. On the subject of noise, vibration and harshness, or NVH, all things can be made to resonate when given the right excitation, but vehicle structures have to be designed to be “dead” when subjected to the inevitable vibrational inputs from the road, suspension and engines. Finally, due to the customer’s demands all these areas have to be addressed in a repeatable way, so that the “monster bracket”, when adorned with the rest of the car results in a product with a consistent high perceived quality. Figure 1 shows the evolutionary structures that will be discussed in this article. It is ironic that the best-loved classic cars fail miserably in all areas of contemporary structural design. The stirring concept of wrestling with a steering wheel to keep in a straight line under full acceleration because the chassis is winding up in reaction to the engines torque thus pointing the axle slightly sideways isn’t really on. Similarly, feeling the steering wheel judder every time you encounter a bump isn’t the sort of steering feedback that we hanker after nowadays. Doors that have to be lifted into position, or harshly slammed, are symptomatic of poor local stiffness, as are fuzzy images in the mirrors at certain revs. As for the crashworthiness of classics, it is simply best to assume that there is none. The Elise was a milestone vehicle for Lotus. Its aluminium bonded structure weighed just 67kg and the aesthetical acceptability of the extrusion dominated design enabled most of the interior trim to be omitted, offering further vehicle weight and cost savings. This was acceptable given the original product profile, which called for a back-to-basics road car suitable for track use, the stripped out appearance fitted perfectly being reminiscent of aluminium structures found in competition sports cars prior to the adoption of advanced composites such as carbon fibre. It excelled in the areas of crashworthiness, stiffness and weight due to its structural purity. The side rails either side of the occupants ran perfectly straight from the front where an energy absorbing composite crash structure was attached, to a point beyond the occupants where a bend occurred enabling the rails to terminate in the correct position to attach a rear suspension subframe. From the Elise structure in Figure 1 it can be seen that frontal crash loads are largely taken past the occupants by these rails. In the event of side impact, the high nature of the original rails offered great protection. In simple terms, these rails were joined together laterally with box like structures. At the front, the “box” consisted of a series of extruded crossmembers which accepted the front suspension and steering, and at the rear the box surrounded the fuel tank. In practice, a torsional stiffness of 9500Nm/deg was achieved. shortcomings to the point where more than ten times the original volume have now been produced. engineering customers. Notable successes were the Opel Speedster/VVX220 for General Motors which shared the Elise structural concept and many of its components. Lotus was the design and development partner to Aston Martin for its Vanquish which displayed the aluminium technology of Elise but introduced more exotic structural composites for the crash structure, screen pillars, transmission tunnel and strut tower brace. These technologies were fine for these low-volume vehicles, but in 2002 we started to investigate a way to develop diverse aluminium vehicles with a higher combined volume. This demanded a different strategy. The challenge was to find an approach to deliver three diverse vehicles with a total of 40,000 units per annum. The first would be a front engined 4x4 crossover with seven seats, the second a mid-engined supercar and the third a front-engined executive saloon as shown in Figure 2. In order to reduce the overall programme costs of realising these different vehicles the necessity of sharing key structural elements, components such as as HVAC and steering, and manufacturing facility was identified. This concept developed was named Versatile Vehicle Architecture (VVA). pressure die castings, or HPDC. These large castings incurred a high tooling cost, but this was acceptable given the projected VVA volume and the opportunities that they offered. A similar philosophy supported the use of castings around the rear wheelhouse. These castings are shown in red on Figure 3 as part of the first VVA structure. Extruded members are shown in blue. The majority of the remaining grey components are conventional press-formed, which although needing expensive tooling were again justified by volume. The red and blue components were such designed that they would suit all three vehicles. 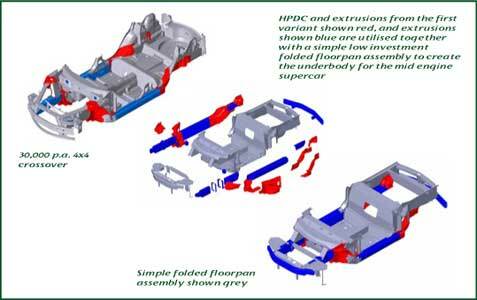 Figure 3 also shows these combined with simple low investment folded sheet or extruded components to realise the structure of the second planned vehicle, the mid engined supercar of which the final design is shown in Figure 4. A similar design exercise achieved the third model. 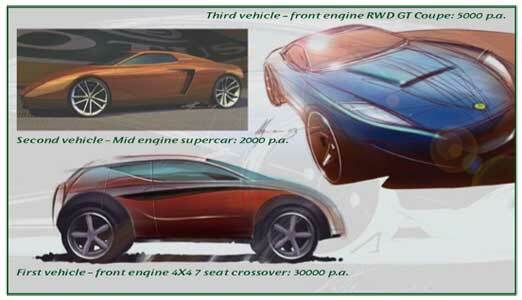 In 2004, Lotus Cars wished to embark on a replacement for the Esprit. Much of the learning, know-how and solution from VVA was well suited to this new challenge. However, a fundamental shift was that the volume requirements were greatly reduced. Certain technologies such as the high investment HPDCs of VVA were not viable for the lower-volume requirements. The result was an evolution of the VVA approach to develop a new sports car focused structure that should be morphable to cater for future Lotus and client requirements at volumes of up to 5,000 per year and the first variant would be the Esprit replacement. Immediate attention was given to the critical footwell area, and a design which showed a great improvement over Elise was conceived, where the siderail was slimmed down beside the feet but then it was supplemented beside the occupant to increase the member size in the area critical for vehicle stiffness. This supplementation also offered a load path for the wheel and tyre during frontal impact. The final embodiment of the design is shown in Figure 5. Figure 6 shows the Esprit replacement structure exploded into elements that are bolted together. At the front, there is a separate subframe. This is to enable its replacement in the event of accident damage when suffering a frontal impact or when the suspension mounting points become damaged. Also shown detached is the front bumper beam which can be replaced if required after a minor frontal impact. The front wheel house panels are integral with the subframe, and provide support to the side mounted radiators, bonnet hinges and headlights. The centre section houses occupants up to 98th percentile, which is about 6ft 5ins tall, extremely impressive for a supercar. The turquoise curved surface at the front provides stiff support to the bottom edge of the windscreen, and a mounting for the windscreen wipers. Front to rear pipework runs down the central tunnel, and an access hole in the rear-bulkhead facilitates service at the front of the rear mounted engine. The A and B pillars, at the front and rear of the door apertures provide stiff mounting points for the door hinges and latches. 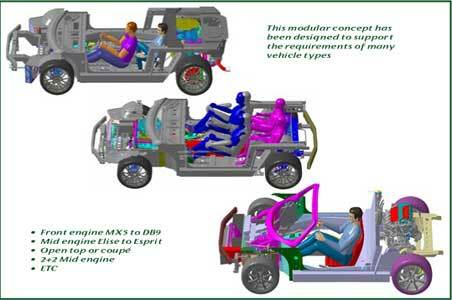 The rear luggage compartment is integral, adding to the global vehicle torsional stiffness. At the rear, the separate steel rear subframe with detachable bumper facilitates crash repair as at the front. 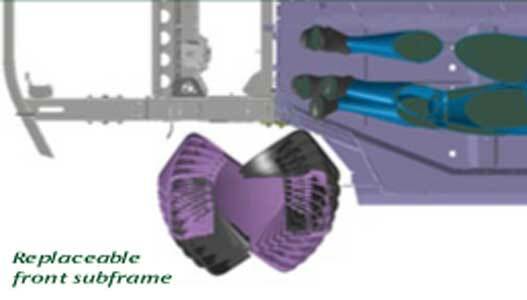 During vehicle assembly, the engine transaxle and rear suspension and exhaust system are all assembled to the rear subframe before this completed module is offered up to the aluminium centre section. 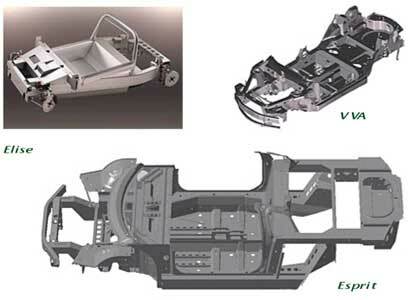 When assembled, these elements constitute the structure of an open top variant, should it be required, with a torsional stiffness of around 14,000 Nm/degree, which is aimed to provide a similar structural feel to the smaller, lighter Elise. With the addition of the upper body of a conventional metal roofed version, then this stiffness more than doubles to 31,000 Nm/degree. for some truly exciting vehicles is here.